On June 18th and 19th 2008 I had two one-day workshops about Oracle in Vienna, Austria. I planned to fly to Vöslau(LOAV) a day before in the afternoon. Unfortunately, the weather forecast for the afternoon were heavy thunderstorms so I had to start early in the morning when the weather was pretty good. 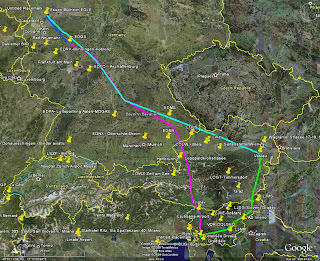 From Divača the route followed the recommended VFR route inbound Maribor airport (LJMB) and bypassing CTR on the south. I crossed the border at TISKO point and then I was flying over Fürstenfeld (LOGF) and abeam Pinkafeld (LOGP) to Vöslau (LOAV) near Vienna. The weather in Austria was better than in Slovenia. I climbed to 7500 feet to clear the clouds over tha last part of the Alps chain. After landing and refueling I left the airplane parked on the grass. On Thursday afternoon after finishing my lessons around 16:00 I hurried with the taxi to the airport and at 17:16 I was already airborn and flying towards Germany. I filed the flight plan via Homebriefing. The route to Essen/Mülheim(EDLE) was: LOAV - ANS NDB - GED VOR - EDLE, a very simple route which was avoiding big German airports. The former owner of my airplane who is captain on Jumbo 747 and also a flight instructor for small airplanes once said: "When flying in Germany one should avoid München, Nürnberg and Berlin airports; all other are not problematic, but on those big ones small airplanes are not very welcome. Beside that, it is also very expensive to land there." Whenever I'm flying in Germany I'm trying to follow his advice. When flying VFR and avoiding big airports one can fly up to 9,500 feet across all Germany. The sky was clear, but it was very windy, blowing about 20KT from west, so it was quite a heavy headwind. When I passed GED VOR I entered into the pretty cloudy area, so I had to frequently change the altitude and also slightly the direction in order to avoid the clouds. In the last 2 hours of the flight I was flying at 100% of possible power to overcome a very strong headwind. The consumption was about 45-50 liters per hour. I also asked Langen Information to notify my destination airport that I'm arriving but due to strong headwind I'll land just before closing the airport. Finally I switched to EDLE frequency and made the final approach. I landed at 21:59 local time, only one minute before the airport officially closed. Of course the personnel was very helpful and they would even wait some minutes over the time if necessary. Next morning I had the annual check at H.B. Sportflugzeug-Service. They were maintaining my Piper for last 14 years and still now I am their client for the annual inspections. While they performed the annual inspection, mr. Stephan Wahl from Airmarin did the annual check for avionics and also installed a new S-mode transponder. Everybody was highly motivated to finish his work in shortest possible time and I was really impressed how everything was running so smooth. Therefore I was able to depart back to Slovenia at 15:25 local time. I made a short stop in Siegerland(EDGS) for refueling with mogas. Again I used Homebriefing to file the flight plan via Internet. The original plan was to fly to Schärding-Suben (LOLS) where I would do another refueling before crossing the Alps. However, when I passed the Munich airport (EDDM) I had still enough fuel for direct flight to Slovenia, so I started to climb first to 9,500 feet and later on to FL128. The top of the clouds over Alps were about FL 110 to FL115. GAFOR for Austria anticipated some thunderstorms on south part of the Alps in the late afternoon so my backup plan was to land at Zell am See (LOWZ) and stay during the night there. However, the weather was quite good and I could pass the Alps with no problem. When I was already close to Slovenian border I had to descend to 9,500 feet and during the descend I had to avoid some clouds. In Slovenia I was surprised by a clear sky. Later on I realized that there were some late afternoon thunderstorms. Only the top of Triglav was still in clouds. After landing in Divača I had still about 75 liters of gasoline. This time the winds were blowing from the right direction so the flight was exactly 4 hours.